New opportunities for bilateral investment were the main theme of the third annual Russian–Japanese Forum on Cooperation in Business, Technology and Culture in Tokyo on May 21. RIR looks at the main ideas shared at the event. Last week, Tokyo hosted the third annual Russian-Japanese Forum on Cooperation in Business, Technology and Culture. The forum, which was organized by Russian daily Rossiyskaya Gazeta and Japanese newspaper Mainichi, featured discussions on four key themes: energy, investment, regional infrastructure, and sports. The greatest emphasis was laid on bilateral investment. 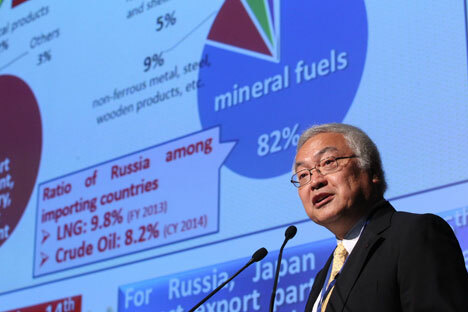 According to Norio Sasaki, Chairman of the Federation of Economic Organizations of Japan (Nippon Keidanren), Japanese businesses are increasingly interested in the Russian Far East. 58 percent of companies in Japan described it as a promising region. Over the last year, 91 percent of the total direct investment from Japan to Russia (around $10 billion) went to the Far East. 140 Japanese companies are already operating in the region. “Japanese companies still desire to invest in the Russian market,” Sasaki said, adding that there weren’t many Russian direct investments in Japan. He believes one of the promising areas could be the development of R&D. “This is beneficial for many reasons, including the fact that Japan has some of the highest levels of protection of intellectual property,” Sasaki added. According to Dmitry Teteryukov, Director of Intelligent Space Robotics Laboratory, Skoltech, there are strong prospects for cooperation in science and technology. He believes robotics could become one of the areas of cooperation. “Russian scientists, known for their developments in the field of artificial intelligence, could work with advanced robots created in Japan,” Teteryukov said.